Tyne and Wear Museum and Archives has a fascinating and poignant set of photographs online on Flickr and Pinterest. 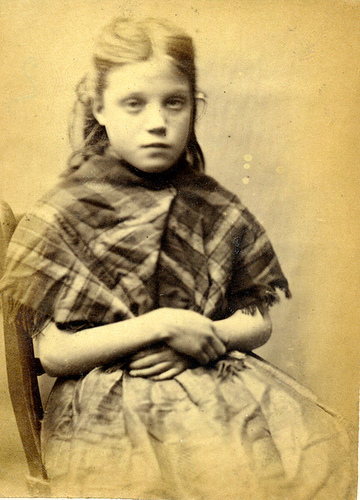 The collection is called Criminal faces, 1871-1873 and many are young children who were arrested for various crimes. All the photos are of prisoners who spent time in Newcastle Gaol between December 1871 - December 1873. When you read through the charges you quickly see that many times the children stole clothing or food. Sometimes they stole small items that could easily be sold. I have no doubt the money obtained went towards food or clothing. The photo on the left is of Ellen Woodman. At the young age of 11, Ellen was ordered to do 7 days hard labour after being convicted of stealing iron when caught with Mary Catherine Docherty, Rosanna Watson and Mary Hinnigan. It's sad to see these young faces as you get the feeling that most were victims of poverty and not hard-core criminals. 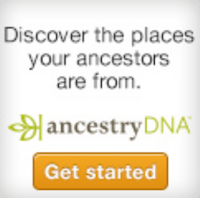 Sometimes in our quest to find an exciting blacksheep ancestor we forget about the human side of things. All photos are copyright to Tyne & Wear Archives & Museums and are used on Olive Tree Genealogy blog in accordance with their copyright information. Thank you for this posting. My husband' s ancestors came from South Shields. The little girl has such haunted eyes and you are quite right to give us a timely reminder about the sad human stories behind our "black sheep". Very sad. Also the photographs of the women. I noticed the great handwriting on most of the boards though. Nice to find this Pinterest page, thanks for sharing. It is sad. It underlines how hard life was at the beginning of industrialization and urbanization. Charles Dickens' A Tale of Two Cities was published in 1859. That book and Dickens' other titles show show desperate times could be for the underclass. Creating a Genealogy Gift for under $50.00! Long Term Coupons from Flip-Pal Mobile Scanner! The S.S. Keewatin is Back Home! Update: 15 more states added to 1940 US Census!